Arvak is a horse that can be summoned from the Soul Cairn after completing Soul Cairn Horse Quest. He can be summoned with the apprentice level conjuration spell Summon Arvak. Arvak has several noteworthy advantages over other mounts: he can't be permanently killed, he costs no money, and you don't need to worry about losing him. Despite being a summoned horse, he can be kept indefinitely (until you dismount) as long as you are riding him when his summon time of 60 seconds expires. Additionally, Arvak is the only horse that can be used in Blackreach or on Solstheim. Soul Cairn Horse Quest: Find Arvak's skull. Arvak can be seen running around the Soul Cairn once in a while before completing the quest. Approaching him will cause him to vanish. If you follow him at a distance he will lead you to a mysterious soul merchant. Although Arvak appears to be undead, he is considered by the game to be a normal animal and is therefore not affected by undead-related spells. Arvak is based on the flaming horse developed during the Game Jam. Arvak cannot be summoned in the Forgotten Vale. The magicka will still be lost and your hand will still do the animation, but Arvak will not appear. Arvak also cannot be summoned in Skuldafn. The magicka will still be lost and your hand will still do the animation, but Arvak will not appear. 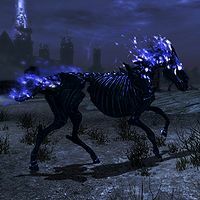 Summoning Arvak once may cause Shadowmere to vanish if possessed, and may even prevent Shadowmere from appearing after The Cure for Madness is completed. ? You can make Shadowmere your main horse again if you are able to find the last location you left him. Generally, he'll be waiting for you at Castle Volkihar main entrance. To take possession of him, mount his back, wait a few hours, then fast travel while still on his back. Next time you fast travel (even by walking), Shadowmere will follow you again. If you are unable to find Shadowmere's location, you can return Shadowmere to you by using the console commands prid 9CCD8 followed by moveto player. Despite Arvak being a unique creature, the original Arvak still can be found in the Soul Cairn while you ride on the summoned Arvak. ? This page was last modified on 27 November 2016, at 01:00.